Not bad a movie. You will most certainly be entertained with Conchata Farrell’s comic action like one line was fantastic. “I haven’t been this hungover since the Pope died”,. We all got a great laugh from this. She bring’s her Two and A Half Men character onto the big screen. The genre of the movie is Horror/Comedy. The visual effects wowwww, but more importantly, the plot was quite simple to follow. The plot being as I said above, was that a young boy wishes the OPPOSITE of wishes. 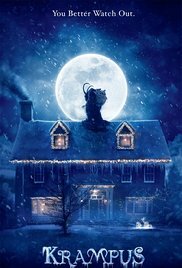 In that mayhem ensues when Max’s family tree comes, ie the Aunts, Uncles, Cousins etc., So in a fit, he rips up Santa’s letter and throws into the sky, hence where Krampus comes and causes mayhem. IN the end, it is found that Max receives a Bauble with Krampus on it. We all thought it was a dream, however when its realised that it wasn’t, who knew. Something tells me a SEQUEL might be on the cards. This entry was posted in Diary and tagged Christmas, movie review, santa. Bookmark the permalink.